Freyssinet Thailand, a subsidiary of the Freyssinet Group companies, is a design and contracting company specialising in structural, repair & Strengthening and geotechnical works. The Group is involved in many forms of construction including buildings, bridges, silos, industrial facilities, nuclear power plants, dams, harbours, tunnels, etc. As the inventor of prestressed concrete and segmental bridge construction, the Group has continued this know-how into the field of stay cable technology - over 80 cable stayed bridges have been built over the last ten years using Freyssinet system. 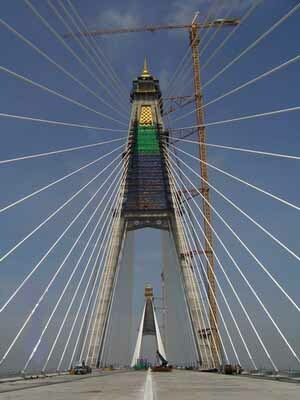 Our technologies are now being included in the supply of suspension cables suitable for the world’s largest bridges. The Freyssinet Group has developed processes for repair and strengthening of structures using Carbon Fibre Fabrics and concrete electrochemistry. Structural instrumentation and monitoring systems have also been developed for various applications in building, bridges, tunnels and nuclear facilities.